Pierre-Marie Leduc was born in Saint-Malo in 1976, and comes from a line of musicians (see photo gallery). He knew at the age of 16 that he wanted to be a violin maker. 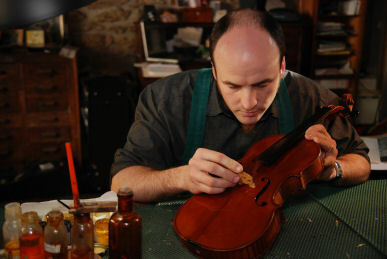 Several training periods in different craft workshops in France and abroad, where he gathered his skills and working methods..
For 3 years Pierre-Marie has been assistant to Jan Strick (famous violin maker in Brussels) where he learned about life and organization of a workshop, contact with musicians, the taste for the restoration and turning of instruments. Strong of all these experiences, Pierre-Marie decides to come back to Saint-Malo and open his own workshop in 2000.